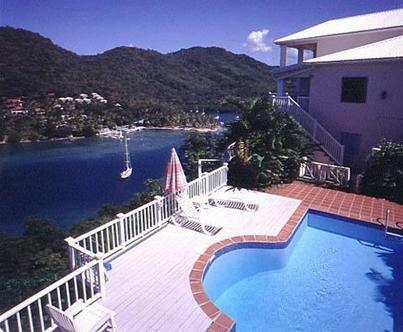 Oasis Marigot is a vacation community nestled on the hillside overlooking Marigot Beach, St. Lucia. We offer different types of accommodations to fit any travel budget. All our units enjoy a spectacular view of the most beautiful bay in the Caribbean. Active vacationers who want a unique experience, such as island hopping on a 42-foot yacht, diving or sailing, will find it at Oasis Marigot. Peace and serenity abound in these beautiful surroundings where you can enjoy our own Nature Trail. There is a PADI dive center on site. The Club offers sail-away options to nearby exotic islands and water-taxi excursions to nearby deserted beaches and snorkeling adventures. Visitors can take a sight-seeing trip to learn about the history of St. Lucia and see the most scenic places. For most accommodations, the resort is accessible only by ferry to ensure vacationers privacy. The trip itself takes just a couple of minutes. Guests must call the North American Office for the resort at least 4 days in advance at 1-800-263-4202 to confirm their check-in time. For last minute confirmations, call the resort directly in St Lucia at 758-451-4185. If guests fail to advise the resort ahead of time, they will not be able to check in. Special requests should be listed in the "Requests" section that appears underneath the "Billing Information" section. Oasis Marigot will make every attempt to accommodate your requests but they cannot be guaranteed. If you have any questions, please call, USA and Canada 1-800-263-4202, UK and Worldwide 00-800-2785-8241. Thank you for choosing to stay at Oasis Marigot.